On June 20, 2016, in both diplomatic and dramatic fashion, the peoples of the Caribbean nation of Puerto Rico stood tall and united on the international stage in an historic manner not previously imagined possible. The opening annual hearings on Puerto Rico of the United Nations Committee of 24, the Special Committee on Decolonization now led by Venezuelan Former Foreign Minister and Permanent Representative Ambassador Rafael Ramirez and made up of twenty-seven nation-states, has long been a time of conflicting viewpoints publically aired regarding how best to move forward vis-a-vis the archipelago island’s status. This year, in the wake of crippling debt and amid widespread controversy about the recent US Supreme Court PR v. Sanchez Valle case and the Puerto Rican Oversight, Management and Economic Stability Act (PROMESA) – both of which place clear control of the island’s political and economic future under the direction of the US government – leaders of every major Puerto Rican electoral party and civil society organization petitioned the international body to intensify their support of a decolonization process which would remove US authority over the nation. Testimony by Puerto Rican Governor Alejandro Garcia Padilla, head of the commonwealth-oriented Popular Democratic Party, was joined by Gubernatorial candidates from the pro-statehood, independence and nationalist parties, all of whom critiqued current conditions on the island and spoke with one voice on the need for immediate release of prisoner Oscar Lopez Rivera, deemed the “Mandela of the Americas” by several Latin American heads of state at the 2015 Organization of American States summit. On the non-governmental level, June 20 was declared International Day of Solidarity with Oscar Lopez Rivera by a coalition led by the National Boricua Human Rights Network (NBHRN) and the Puerto Rican Human Rights Campaign (CDHPR), and included Olga Sanabria Davila, President of the Committee for Puerto Rico at the United Nations. 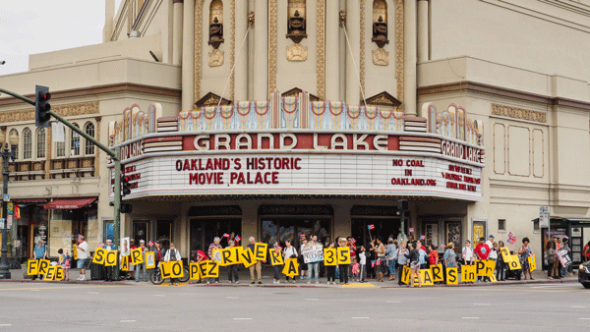 Support actions for Lopez Rivera’s clemency were held in a startling forty-three countries, well beyond the original expectations of the coalition initiators, who had hoped for at least thirty-five actions representing each year of Lopez Rivera’s unjust imprisonment. At age 74 and behind bars since 1981, Lopez Rivera is the longest held prisoner in Puerto Rican history, convicted solely for the thought crime of seditious conspiracy – the same charge South African President Nelson Mandela served twenty-seven years in jail for. 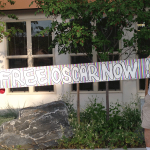 The June 20 actions began with a virtual “pray-in” for Oscar’s unconditional freedom coordinated by South African Archbishop Emeritus and Nobel Peace Laureate Desmond Tutu, in conjunction with four additional Nobel Laureates from a total of five continents. East Timor’s former President Jose Ramos-Horta, Argentina’s Adolfo Perez Esquivel, US-based Jody Williams, and Mairead Corrigan Maguire of Northern Ireland all took part in the prayerful vigil; Corrigan Maguire added that she will light a candle for Lopez Rivera as the prominent human rights elders pledge to continue to work for Oscar’s release. In an unprecedented move at the UN Decolonization hearings – and in the context of both an in-session mobile phone conversation between Lopez Rivera and Ambassador Ramirez, and a standing ovation following the testimony of Oscar’s daughter Clarissa – Bolivian Permanent Representative Ambassador Sacha Sergio Llorenty Soliz proposed that the Committee of 24 engage directly in the work to free Oscar and commit to visiting him in prison, a proposal enthusiastically endorsed by the UN body. “Sometimes the historical moment strikes unexpectedly,” commented Hostos Professor Ana Lopez, New York Coordinator and a key international activist of the Campaign to Free Oscar. “It is said that the stars become aligned guiding the path of righteousness. 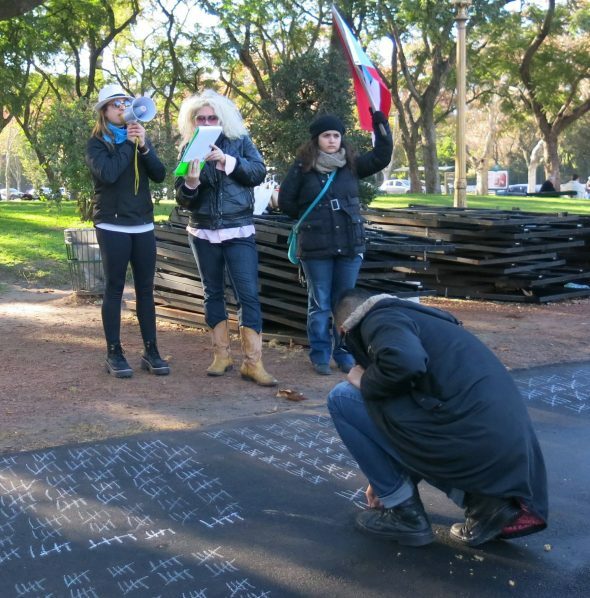 On June 20, the unanimous passing of the United Nations resolution, calling for Puerto Rico’s right to self-determination and for Oscar’s release without delay, was such a moment.” Affirming the reach and response of the solidarity actions as “nothing short of miraculous,” Professor Lopez noted that the activities – which took place across six continents in Algeria, Argentina, Australia, Bolivia, Burundi, Canada, Chile, China, Colombia, Cuba, Dominican Republic, East Timor, Ecuador, England, Eritrea, Ethiopia, Euzkadi, France, Germany, Greece, Haiti, India, Italy, Kenya, Mauritius, Mexico, Netherlands, Nicaragua, Nigeria, Northern Ireland, Palestine, Philippines, Puerto Rico, Russia, Scotland, South Africa, Spain, Sweden, Switzerland, Syria, Trinidad and Tobago, USA, and Venezuela – were extremely diverse in nature. 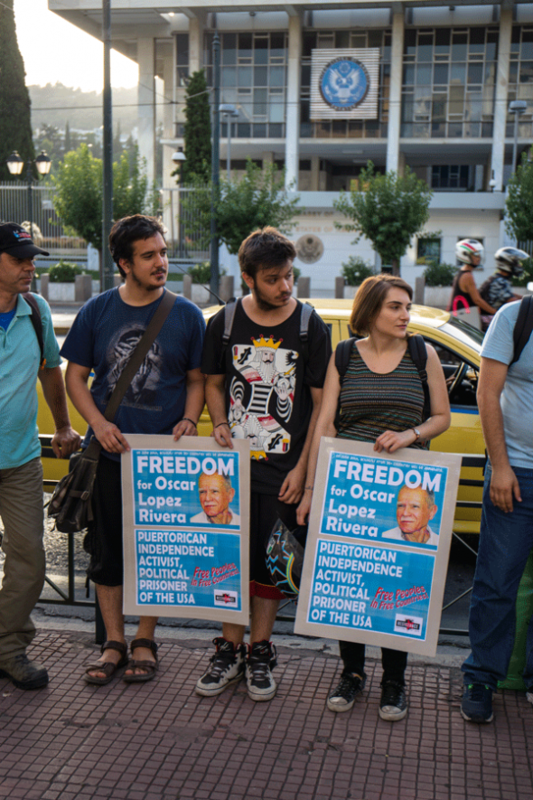 In addition to the pray-in and candlelight vigils, groups held demonstrations at key sites of international and US connections, including a quickly-dispersed civil disobedience in front of the US embassy in Athens, Greece. 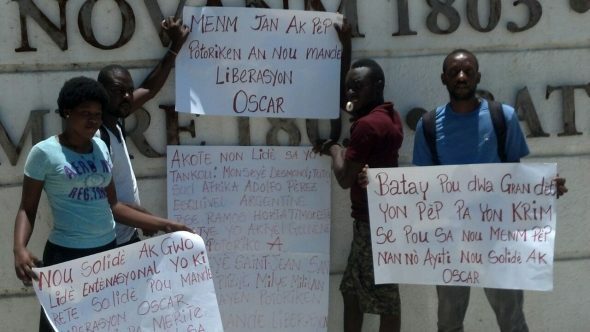 In the Indian Ocean African nation of Mauritius, the indigenous party Lalit held a protest linking Oscar’s freedom and Puerto Rico’s colonial status with the US occupation and use of Diego Garcia as a nuclear military base, much as the US occupied and used the Puerto Rican island of Vieques for decades. In addition to serving on the June 20, 2016 International Solidarity with Oscar campaign committee, author Matt Meyer is a representative of both the War Resisters International and the International Peace Research Association, for which he serves as UN representative affiliated with the Department of Public Information and the UN Economic and Social Council. View available graphics, video and photos from June 20th here. View Youtube videos from Argentina, Denver-US, Oakland-US and Sweden here. 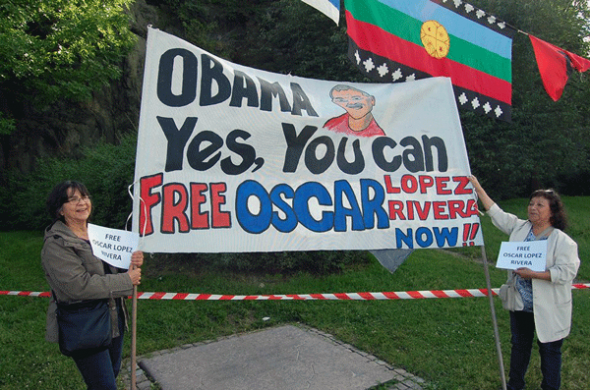 June 20 became unofficial Oscar López Rivera Day. At the United Nations Decolonization Committee’s annual hearings on Puerto Rico, almost every one of the more than 65 presenters called for Oscar’s release, as did many of the international organizations, delegates and member states, including the Non Aligned Movement (comprising 120 countries), Cuba, Venezuela, Bolivia, Ecuador, Nicaragua, and Syria. Oscar’s only daughter Clarisa López Ramos almost brought the house down, with her own moving account of getting to know her father in prison, and her reading his letter expressing the yearning of a colonialized people to be free. A line of well-wishers waiting to hug her followed the rousing standing ovation. Late afternoon, in the middle of the hearing, Oscar phoned his attorney Jan Susler, who promptly offered the phone to Rafael Ramírez, Chair of the Decolonization Committee, who gladly accepted the opportunity. Then after Oscar spoke to Bolivian Ambassador Llorenti Solíz, Chairman Ramírez, who hoped to broadcast Oscar’s call to the international community gathered in the hearing, attempted to put him on speakerphone. To the disappointment of all, the Bureau of Prisons immediately disconnected the call, but that didn’t stop the chairman from speaking energetically to the hearing about his brief chat with Oscar. 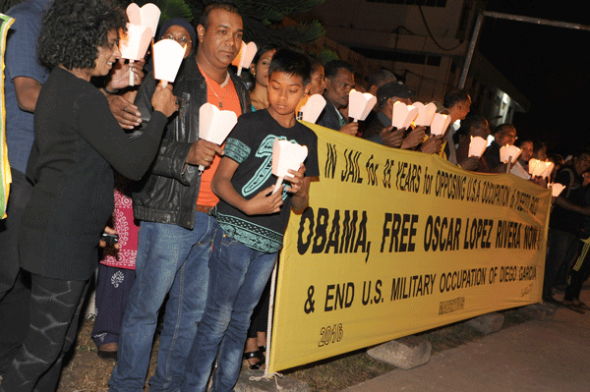 Outside, the New York Coordinadora for his release held a rousing rally, as their part of the International Day of Solidarity with Oscar, becoming one of varied expressions of support for his release which took place in 35 countries throughout the globe. Five Nobel Laureates on five continents joined this effort, with Archbishop Desmond Tutu (South Africa) including in his morning prayer that President Obama “exercise his singular power of pardon and grant unconditional and immediate freedom” to Oscar. Mairead Corrigan Maguire (Ireland) lit a candle for Oscar, and committed to continue to pray for his release. Their Nobel colleagues Jose Ramon Orta (East Timor), Adolfo Pérez Esquivel (Argentina) and Jody Williams (U.S.) made similar expressions. After the hearings and the demonstration, the Committee for Puerto Rico in the U.N. hosted a reception at the headquarters of SEIU Local 1199, where Oscar once again figured large. Sometimes the historical moment strikes unexpectedly. It is said that the stars become aligned guiding the path of righteousness. 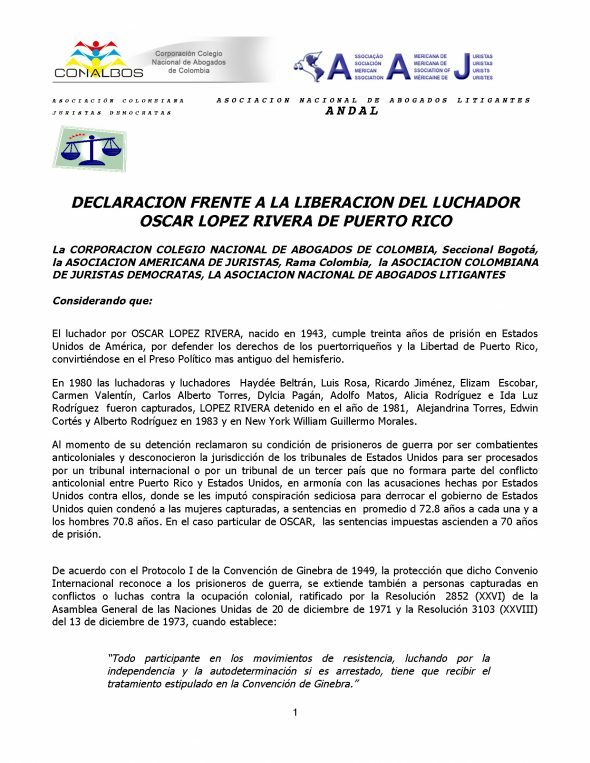 On June 20, 2016, at the United Nations a resolution was unanimously passed calling for Puerto Rico’s right to self-determination, the Special Decolonization Committee of 24 called for a prison visit to Oscar and his immediate release without delay. 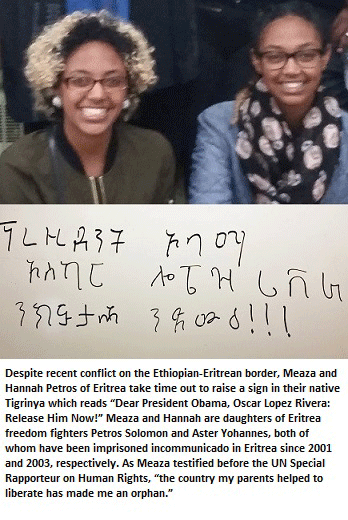 Clarisa Lopez Ramos after her statement to the UN read a special letter from Oscar about “What freedom means to me”. Clarisa read with great emotion impacting the delegates and observers prompting a standing ovation of all committee members and observers. The phone call from Oscar and his conversation with Ambassador Rafael Ramirez, chair of the Decolonization Committee at that particular moment was short of a miracle. What we witness on June 20 at the UN was historical. 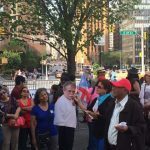 A press Conference was held at the Dag Hammarskjold Plaza 47th Street and First Avenue while a rally took place “Global Campaign Callings for Release of US-held Puerto Rican “Mandela of the Americas” Political Prisoner Oscar Lopez Rivera. Subsequently, Clarisa López Ramos, Oscar’s daughter, Jan Susler, Oscar’s lawyer, former political prisoners Adolfo Matos Antongiorgi and others were interviewed and aired at Univision, telemundo, TeleSur and local written media.